And that right there should give you a greater appreciation for California Chrome. Even if he was only prepping for the Dubai World Cup, California Chrome still was only second best to Shared Belief in last month’s San Antonio. But California Chrome at least made Shared Belief work for it. At this moment, you can probably count on the fingers of one hand the number of horses capable of making Shared Belief run. For the win, Shared Belief was given a Beyer speed figure of 111, and a TimeformUS figure of 117. “One of these days Shared Belief will actually have to run late and pop a 130,” tweeted TFUS figuremaker Craig Milkowski. The question is, who’s going to make him? Jay Privman reports that the Met Mile could be Shared Belief’s next target. 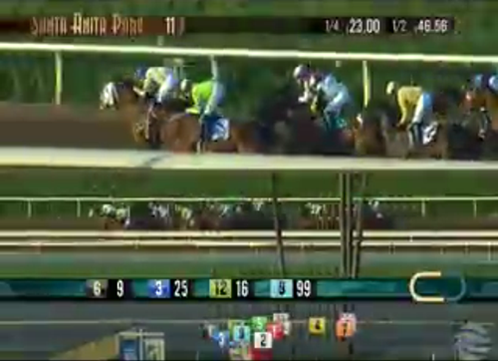 Here’s another question: How is that Santa Anita has gorgeous HD video (see the replay above), but the live video feed looked like the screenshot below while streaming on both the ADW platforms where I have an account? Beyer speed figures for Saturday’s Kentucky Derby preps: Dortmund earned 104 for the San Felipe, Carpe Diem 98 for the Tampa Bay Derby, and El Kabeir 89 for the Gotham. Get the charts, replays, TimeformUS figures, and the updated leaderboard via the big Derby prep schedule.